Learn why you should choose Global Mobility Solutions as your relocation management company. Customers choose Global Mobility Solutions’ business model because it is rooted in providing our clients and their transferees the freedom of choice. This means our clients are given the choice to work with “the best of the best” service providers in any market around the globe. GMS is able to offer this unique model in the industry because unlike most relocation companies, we are not owned by or affiliated with any one real estate, household goods, or any 3rd party service provider. GMS has been able to build strong relationships with top providers all over the world who act as an extension of GMS. Our worldwide network of partners allow us flexibility while providing our clients with a real-time, on-the ground consultant to assist with the day to day needs of the individual and family moving. Freedom of Choice™ means you can utilize the suppliers from our established network of providers or we can partner with any preferred providers that you may already work with. GMS offers our clients flexible service options. Clients can pick and choose the services they wish to offer relocating employees. This has proven to be cost-effective for formal relocation policies, but also allows clients the ability to utilize services on case by case basis. GMS is able to provide our clients with significant cost savings through the relationships we have with our network of providers and our Pre-Decision Program. By getting involved very early in the relocation process before a final decision to move occurs, GMS can help clients reduce the number of failed relocations, increase job acceptance ratios, provide an accurate budget to work from, eliminate the risk of non-acceptance by the transferee/assignee, discover any potential home sale issues, streamline house hunting trips, and minimize policy exceptions. Through our network of providers we are able to provide on the ground support and assist with local information anywhere in the world (i.e. visas, housing costs, local customs and culture). Our US based operations team and online systems are available 24/7. No matter when your transferees/assignees or international offices need assistance, we can accommodate them. The GMS service model provides a single point of coordination for all components of the move process. Our relocation coaches possess an average of 9 years industry expertise. They have produced better than 98% customer satisfaction results over the last 5 years. This is why our clients choose GMS. Companies achieve the most success with a customized, right-fit program for relocation that is specifically designed to meet their unique requirements. Employees and their families expect a broad range of services to help them during their relocation process. 1. Does Your Program Align With Our Needs? 2. Does Your Program Provide Dedicated Account Management and Mobility Consulting? 3. Is There a Single Point of Coordination? 4. 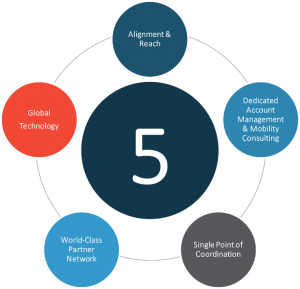 Does Your Program Provide Access to a World-Class Partner Network? 5. What Global Technology Does Your Program Provide? The most successful corporate relocation programs are customized, providing a right-fit that aligns with company objectives and employee’s expectations. Global Mobility Solutions provides its clients with a Freedom of Choice™ model that sets the industry standard of excellence. Be sure you ask the right questions of your Relocation Management Company so you get a customized, right-fit program, and you choose the right partner.